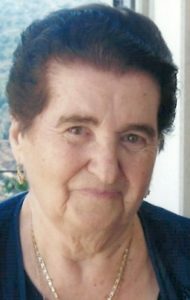 Ploumou Flouras, 92, of Manheim Township, formerly of N. Lime St., Lancaster City, passed away peacefully on Saturday, April 6, 2019 surrounded by her family at her son’s home. She was born in the village of St. George Sikousis on the Island of Chios, Greece and was the daughter of the late Pantelis and Irene (Kakaridis) Vafias. She was preceded in death by her husband, Costas N. Flouras in 1983. They were married in 1950 in Chios, Greece and in 1967 they moved to Lancaster, PA to be with family. Ploumou loved baking tsoureki bread and Greek pastries and exchanging recipes with her family and friends. Several of her recipes were used at the family restaurant that many knew of, The Red Rose Restaurant, at the corner of E. King and N. Duke St., which was founded by the Flouras family in 1926. She was a diligent gardener and loved tending to her red rose bushes. She also took pride in growing grape leaves in her back yard and using them to make yiaprakia on Greek Day at the restaurant. She was a faithful and long-time member of The Annunciation Greek Orthodox Church and the Philoptochos Society. Ploumou enjoyed bible study with Rev. Alexander Veronis and was awarded Mrs. Philoptochos Society in 1991. Surviving is a son, Nicholas C., husband of Tina, of Lancaster, three granddaughters, Dana, wife of Nick Panagopoulos, of Lititz, Angela, wife of Charles Rieck, Christina Flouras, both of Lancaster, five great grandchildren, George, Sophia, Katerina, Markella, Charlie, and a brother, Nikitas Vafias, of Melbourne, Australia. She is also survived by many loving nieces and nephews. She was preceded in death by a son, Vangelis (1976), and four brothers, George, Costas, Stefanos, and Zacharias. Funeral Services will be held on Tuesday, April 9, 2019 at 10:30AM at The Annunciation Greek Orthodox Church 64 Hershey Ave. Lancaster, PA 17603 with Rev. Hector Firoglanis and Rev. Alexander Veronis. A viewing will be from 9AM-10:30AM at the church. Interment will be in Lancaster Cemetery 205 E. Lemon St. Lancaster, PA. Memorial contributions may be made in her memory to The Annunciation Greek Orthodox Church. Ploumou was a loving,giving and caring wife, mother, grandmother and great-grandmother who was well-liked and respected by the Greek-American community in Lancaster as well as by the people of the village Agios Georgios Sykousis in Chios Greece where she originated from. In the final years of her life she was blessed to have been lovingly taken care of by Nick and Tina, who remained faithful to the time-honoured tradition in the homeland where it is a mark of pride for kids to tend to their elderly parents at home. My family and I extend our deepest sympathy to Nick, Tina and the kids and to all Ploumou’s loved ones and relatives.